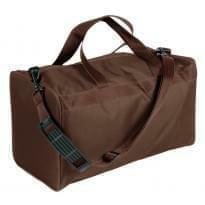 Brighten Up Any Event With A Durable Weekender Getaway Bag. Black 15 Oz Cotton Canvas Duck Fabric. Board Bottom with Metal Studs. Red 1-1/2 Inch Poly Webbing Handles.